Pioneer launches new budget AV receivers for 2015 | What Hi-Fi? It's Pioneer's turn to announce its new entry-level AV receivers for 2015. Pioneer's opening gambit consists of three new models, the VSX-830 (£399), VSX-930 (£499) and VSX-1130 (£599), all of which go on sale in May. 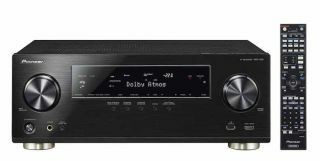 They're the first Pioneer AV receivers off the production line following Onkyo's acquisition of Pioneer's AV division earlier in the year. The VSX-930 and VSX-1130 get the headline features, including Dolby Atmos functionality, Pioneer's MCACC PRO speaker calibration software and a higher quality DAC, compared to the VSX-830. The main difference between the '930 and '1130 is the latter has an aluminium front panel instead of plastic. All three amps feature HDMI 2.0 inputs, which are compatible with 4K video at 60fps (frames per second). HDCP 2.2 ensures all the amps will be compatible with 4K Blu-ray discs, when the format finally launches later in the year. Wi-Fi and Bluetooth are both present too. The trio all support high-resolution, multi-channel audio - up to 5.1ch, 24bit/192kHz WAV files via USB, up to 5.1ch, 24bit/96kHz FLAC files over a wired network connection and 24bit/48kHz files over a wireless connection. All three receivers support MP3, WMA, AIFF, WAV, FLAC, Apple Lossless and DSD files. But the features don't stop there. There's built-in access to vTuner internet radio and Spotify Connect, a brand-new user interface, and the amps all come equipped Pioneer's AVNavigator software which gives an interactive guide for set-up. Download the company's iControlAV5 app for iOS and Android devices as an alternative to their standard remote.